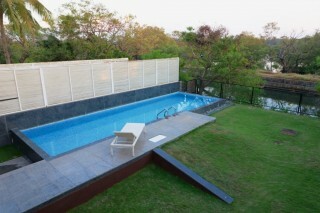 Located just a kilometre away from Candolim Beach, this property on offer is a deluxe villa that houses four bedrooms. 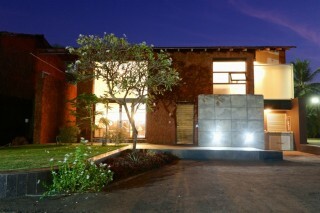 It can collectively accommodate up to twelve people and is perfect for a group of friends or a family holidaying together. This pet-friendly property provides a caretaker and housekeeping services to cater to all your needs and to ensure that your stay is comfortable. 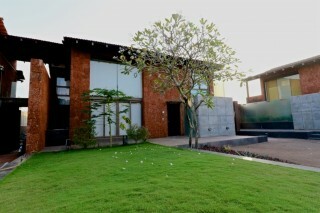 Your Space A well-manicured lush green lawn fronts this stunning villa that flaunts an exposed laterite brick and glass facade. 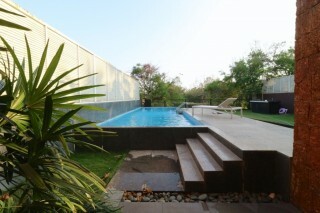 A bright azure swimming pool sits in the backyard of the property, flanked by a well-tended lawn on one side. 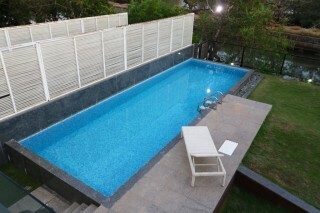 A sun lounger is placed on the pool side, so you can relax after a swim. Inside, this air-conditioned villa boasts a chic layout and décor, with high ceilings, French windows, handsome furniture, and an overarching minimalist design. 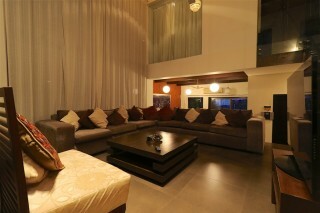 The living room is well furnished with a plush L-shaped sofa with an abundance of fluffy cushions. A comfy chair, a contemporary coffee table, chic console and corner tables, and stylish corner lamps complete this space. 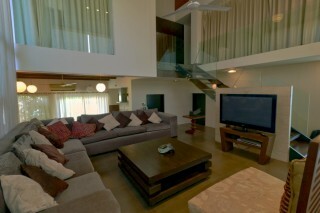 A big LCD TV is placed facing the furniture, so you can relax and watch your favourite shows even when on vacation. Guests are requested to provide valid identification at the time of check in. Travel assistance is available.